Looking for something unconventional for Dad this year? I know that many of the traditional golf and tie related gifts sometimes don’t suit the papa in this household, so I’m often looking for something unique that is either homemade or eco-friendly. We don’t go all out when it comes to spending money on gifts for special occasions like this but instead try to make something simple, and then focus on celebrating as a family. 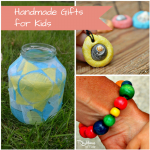 Which is why I love all of the amazing do-it-yourself gift ideas that even kids can make. 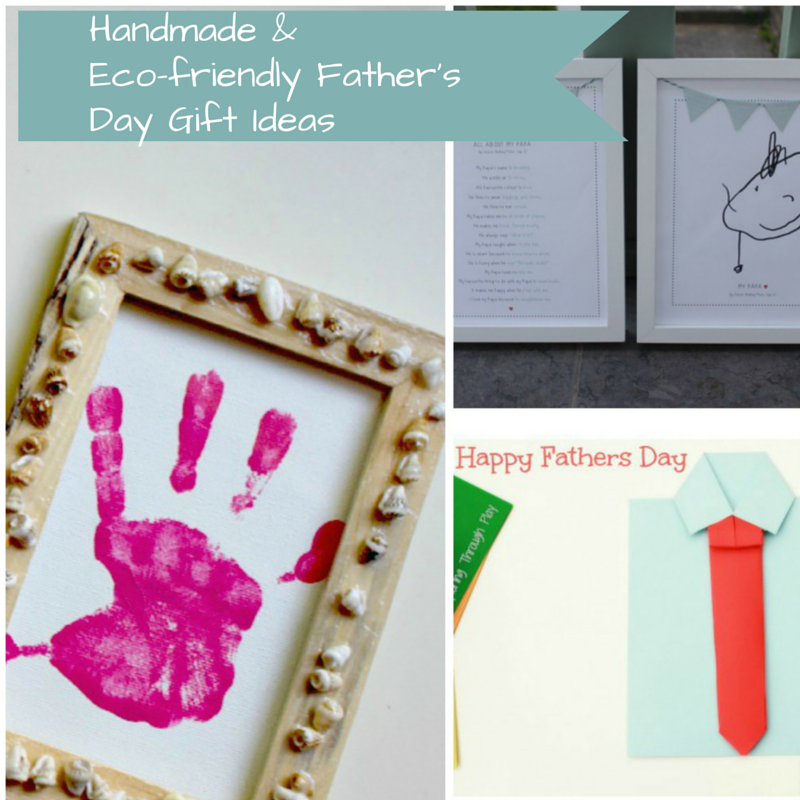 I’ve included a mix of both in this round-up of eco-friendly and handmade Father’s day gifts. – DIY as well as store-bought – that will give you plenty of options. DIY Shell Frames with Handprint from Rhythms of Play – These shell frames are adorable and something that even little hands can do. 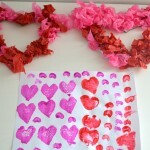 This would make a fun afternoon craft to make together. Add a handprint of the child/children or even a picture of dad with his kid/s. Father’s Day Tie Cards from Learning and Exploring Through Play – How sweet are these cards? I love the concept, and for the business-oriented dad, these would be perfect. Father’s Day Printables for Homemade Gifts from Kinzie’s Kreations – I really love hearing what my little guy has to say for questions like these. He filled one out for Mother’s Day and it was so cute – apparently I was born “in the big purple city” and his favourite thing to do with me is “just play.” I enjoyed hearing his replies and we’ll definitely be filling out something similar for dad, like this great printable here. Keep it in a memory box like handprint memory box from Mama.Papa.Bubba.Blog. Watercolour Hand Print Art from Cobwebs, Cupcakes and Crayons – We are big watercolour fans in this house, so it’s no surprise that this is a favourite of mine. I think we’ll be doing it this weekend! I Love You This Much Card from A Day in My Life – This simple and easy craft should take no time at all but is such a cute idea. 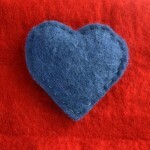 Father’s Day Cracker from Seeds & Stitches – What a fun idea! I love the thought of adding in something sweet like special messages from the kids or drawings. Father’s Day Interview and Portrait from Mama, Papa, Bubba Blog – Another questionnaire-type gift, I really like how this combines two sweet ideas that I’m sure would make any dad happy. My Dad Rocks by Crafts by Amanda – Rocks are a big hit in our house and K loves to paint them, especially to give away as simple gifts. There are a couple different ideas here but I really like the first spin on the rock craft that Amanda shows. I would love to make one of these. Wooden Key Chain by Easy Peasy and Fun – You can never have enough on your keychain, right? Even though my hubby’s keychain is already bursting at the seams (it’s literally massive and heavy), I know he would gladly add this cute and special piece to it. Puzzle Coasters from Red Ted Art – I’m a big puzzle fan but never really know what to with a puzzle once I’ve completed it. This is a great, fun and eco-friendly idea for Father’s Day. If you don’t have time to make anything or aren’t feeling overly crafty, have no fear: there are plenty of eco-friendly, natural alternatives you can buy for the dad in the house. A Composter would definitely be appreciated by any dad with a green thumb. 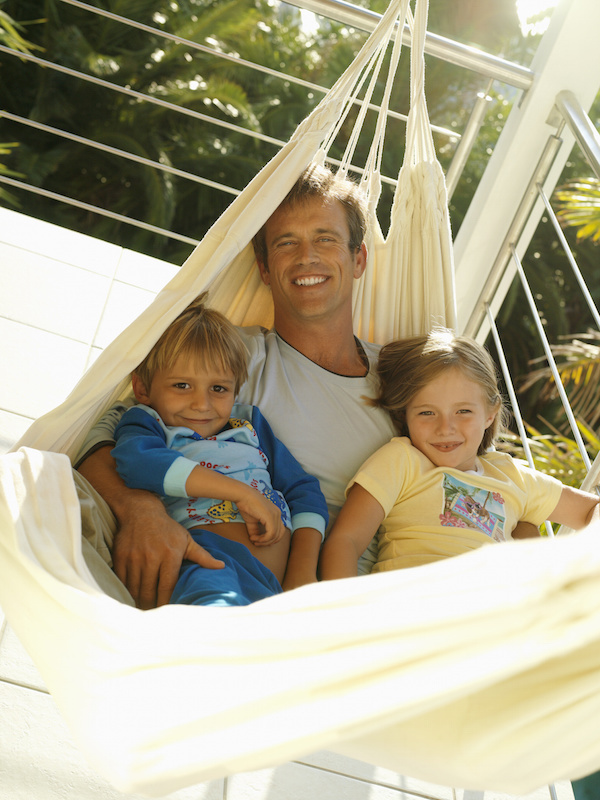 A Hammock is something that any dad could use – they all deserve to relax once in a while! A Tomato or Herb Plant for the gardener dad. Have the kids decorate the pot first with paint and then seal it before planting anything in it. A selection (or even beer cake if you’re so inclined) of local, craft brew or beers from an organic brewery would be appreciated by any beer lover. A bottle of organic, biodynamic wine is also a great gift. Check out Gaiam’s article on how to choose organic wine for some helpful tips. A pass to a local climbing gym would be a big hit for many dads I know. A gift certificate for a round of golf at their favourite golf course. This way they can get in some dad time and active time. 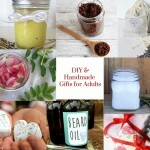 This is such a fabulous collection – I need to come up with some easy Father’s Day crafts for the kids ASAP so thanks!